society, as various sectors directly depend on water. Adaptation to climate change is needed now and water management should be a central element in the adaptation strategy of any country. A particular challenge for water resources management is connected to the fact that almost half of the world’s total land surface is drained by international river basins. As both water and climate change do not respect borders, transboundary cooperation in climate change adaptation is not only necessary to prevent possible confl icts due to unilateral adaptation measures, but also benefi cial to enable more eff ective adaptation. 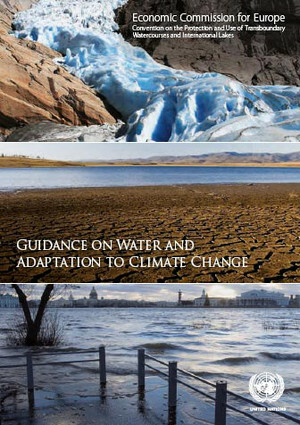 The Guidance on Water and Adaptation to Climate Change aims to spur climate change adaptation that takes into account the transboundary dimension of water management. It is a novel and innovative product which focuses on the transboundary setting and illustrates the steps needed to develop an adaptation strategy.Based on the concept of integrated water resources management, the Guidance provides advice to decision makers and water managers on how to assess impacts of climate change on water quantity and quality, how to perform risk assessment, including health risk assessment,how to gauge vulnerability, and how to design and implement appropriate adaptation strategies. base, and enlarging the range of measures available for prevention, preparedness and recovery, thus allowing us to fi nd better and more cost-eff ective solutions.